A species found in a variety of habitats including ponds, gravel pits and lakes. P. concinna migrates readily, has been taken in light traps and has been recorded flying at an altitude of about 750 metres. It is a species that can tolerate reasonably high salinities, although is replaced by Sigara stagnalis in more extreme, usually coastal, situations and is more characteristic of open water than well vegetated habitats. The map is based on records from NBN Gateway, with yellow dots showing pre 1990 records, reds dots 1990 – 2015 records and red on yellow dots overlapping records. 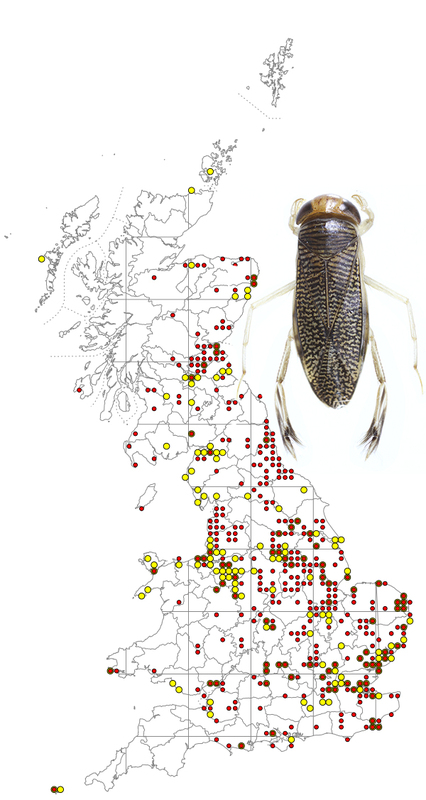 P. concinna occurs in Ireland, with scattered records in the north and mainly eastern coastal records further south. 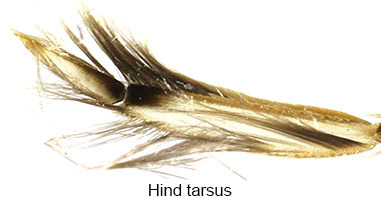 P. concinna (length 7.0-8.0 mm) can easily be distinguished from similar species of Sigara (it used to be classified as Sigara concinna) by the pattern of black marks on the hind tarsus, which occur both on the claw and apex of the adjoining segment (see below).